really good developers are smart people and they also like to live well. I don’t think it is "borderline irresponsible" to do a startup in the NYC area, in fact I think it’s a great place to do a startup, but I agree with the dilemma that Dan and others have been pointing out for years – it costs a lot to live in NYC and the best developers can make a ton of money working on wall street. So what do you do about it? Company 2 – has it’s product management in NYC and all of it’s developers are in a suburb of Philadelphia, a short car drive away. So there you have it. Not one single Union Square Ventures company that is headquartered in NYC currently has all of its engineering team in NYC. Each has organized development and engineering differently to suit the needs of the business and to involve people they know and trust. I am not suggesting this is the only model that works in NYC. 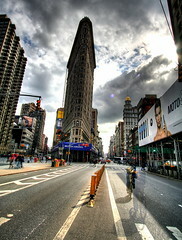 I have two Flatiron portfolio companies, Alacra and Return Path, with development teams in NYC. Alacra does all of its development in NYC and makes it work. What I am suggesting is that entrepreneurs should start businesses where they want to work and then organize the company according to what works best for them. The whole company, particularly development, does not need to be in one location anymore.